e all know that target shooting is popular in the U.S., with an estimated 20 million people participating regularly. But when you factor in the youth, family, friends, and other guests who experienced shooters bring with them to the range, the number pushes 50 million—and if those individuals continued to shoot, we could more than double the number of regular target shooters. 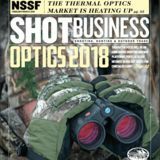 Turning interested shooters into regular shooters could increase your business and improve the industry as a whole. 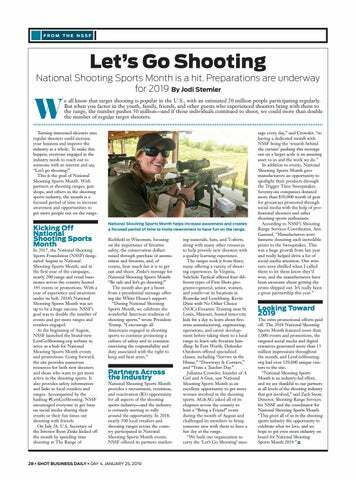 To make this happen, everyone engaged in the industry needs to reach out to someone with an interest and say, “Let’s go shooting!” This is the goal of National Shooting Sports Month. With partners at shooting ranges, gun shops, and others in the shooting sports industry, the month is a focused period of time to increase awareness and opportunities to get more people out on the range. National Shooting Sports Month helps increase awareness and creates a focused period of time to invite newcomers to have fun on the range. SHOT Daily from day 4 of the 2019 SHOT Show.